Math Fluxx is really all about the numbers. Players use positive integers (whole numbers) in their quest to achieve a very mathematical Goal. But it's not just putting 4 and 2 together to achieve the 42 Goal (for example); Math Fluxx also features the Plan B Meta Rule. Plan B puts Special Victory Rules into play which give you a second way to win and require even more arithmetical acumen (ex. Plus Victory lets you win if your Keepers add up to the current Goal). 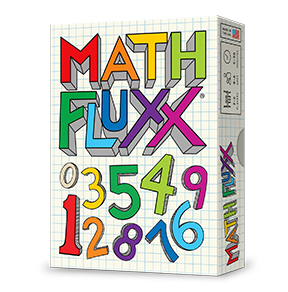 With Math Fluxx, the fun is exponential!